A suspected drug peddler who looks like actress Heart Evangelista has been arrested during a buy-bust operation Sunday night in Davao City. A certain Unsunghero Twothousandfour posted a police report and photos of the suspect who allegedly sells illegal drugs in clubs and bars. Also posted were pictures of the evidence gathered during the operation led by members of SAIDSOTFU of the San Pedro police station. The 20-year-old suspect, identified in the report as Erica Angela Yanong Fernandez, also known as "Kambal" or Roxy Heart, was apprehended along Anda Street, Brgy. 3-A, at around 11:50 p.m. on July 26. Fernandez, single and a resident of Sto. Niño, Matina, Brgy. 75-A, Davao City, was arrested after she sold one piece big size heat-sealed plastic transparent sachet containing suspected shabu to a police operative who posed as buyer. 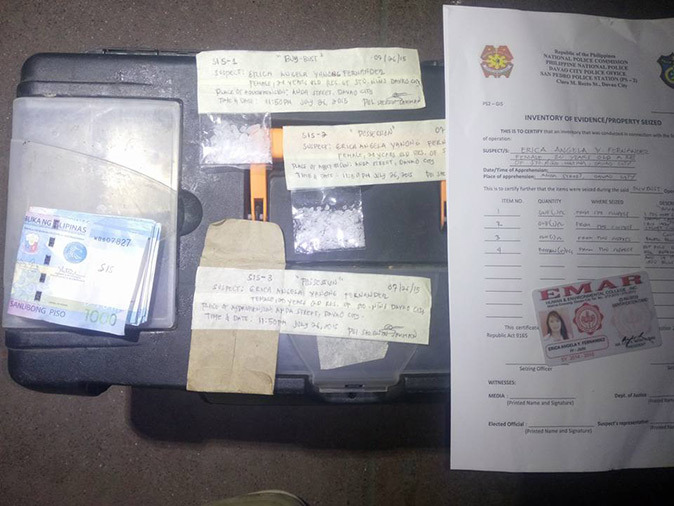 During the search, another piece of a big size sachet of suspected shabu with an estimated total street value of more or less P90,000 was also recovered from her possession and control, the report said. The suspect as well as the seized pieces of evidence are now in police custody, according to the report.